-Does that afternoon or late night sweet tooth kick in every now and then?! Try these frozen blueberry bites you won't be disappointed! -Place blueberries and Greek yogurt in two separate bowls. Place a piece a parchment paper on a large baking sheet. 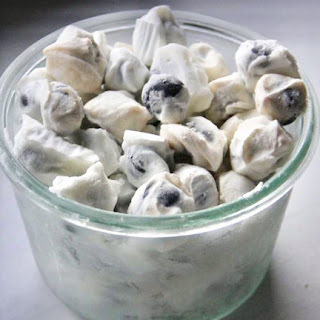 -Drop each blueberry into Greek yogurt with a spoon, swirl around to coat and place on the parchment paper. Repeat until all blueberries are covered. -Freeze for an hour or more, then enjoy as you please.